Are you a hiker? A true lover of nature? If I were to tell you that for a very reasonable price you could visit several trails that would knock your socks off – would you believe you could find it all in Ohio? 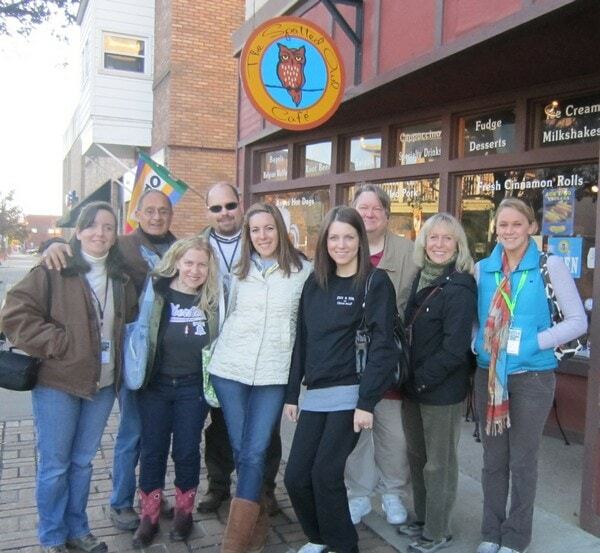 Last week I was invited to attend a press trip in Hocking Hills, Ohio. As a New Yorker I have to be honest – the area wasn’t really on my radar. When I think “vacation” I think overseas under a hut on a beach or I think amusement parks with the kids. This was something I would have never considered and today I am so very thankful that I had the opportunity to join the fun. When I landed in Columbus I was manic (as usual). My flight was delayed and I knew that my group would be off schedule. After a friendly hello we all hopped in a car and headed to the Inn and Spa at Cedar Falls – a family owned business that boasts quaint cottages and log cabins for all their guests. 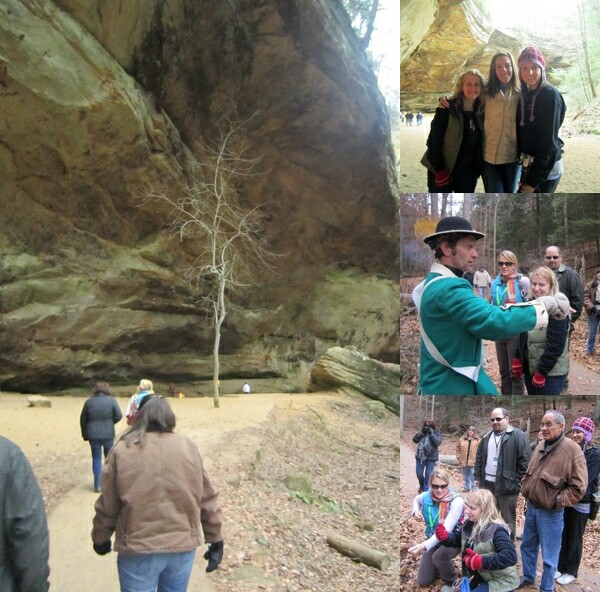 As we rode through Ohio, our tour guide and new friend Amy suggested we make a quick stop to Old Man’s Cave. We didn’t have time to do the full tour but she didn’t want us to miss this natural wonder. When I arrived something physically happened to me – I slowed down. My eyes widened and my breathing calmed. This was IT – what visiting Ohio is all about. As a city girl the view was foreign and perhaps more beautiful to me than others who might have been used to such sights. If you missed that post – click here. It was at that moment that I knew I made the right decision – that Hocking Hills is where I had to be for the next few days because I was going to have experiences that I would have NEVER had otherwise. 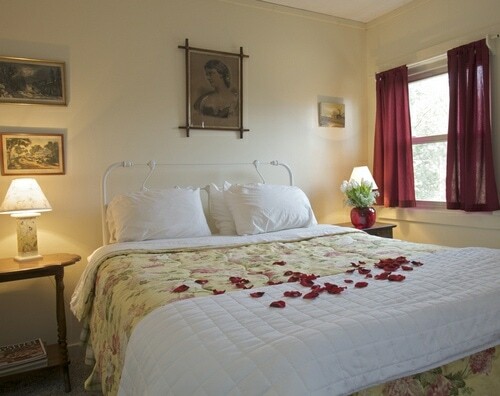 The Inn and Spa at Cedar Falls was just perfect. Initially I had a heart attack when I heard that there was no TV, no phones and no cell service in the region. The TV I could do without – but no cellphone? I don’t understand. Miraculously I made it through the long weekend. Who would have thunk it?! Our first evening was filled with a beer tasting with Rock Mill Brewery, great conversation and fantastic food. The owners spoke to us about how they built everything by HAND . When I say everything I MEAN EVERYTHING. Even the table we were eating on was made by our gracious host. Ah-mazing. I had the opportunity to get a massage at their spa. I have vertigo and couldn’t do some of the activities that were planned for the group (scenic air tour and zip lining). So instead of having me twiddle my thumbs for 3 hours they allowed me to choose a service and I opted for a complete back massage which included a mud mask. I ALMOST fell asleep which really says a lot because I hardly ever relax THAT much during a session. Over the next few days we had the opportunity to visit several wonderful establishments. I’ve already told you about the Candle Shop where I made 2 of my very own candles. I lit one last night and it was OH SO GOOD! 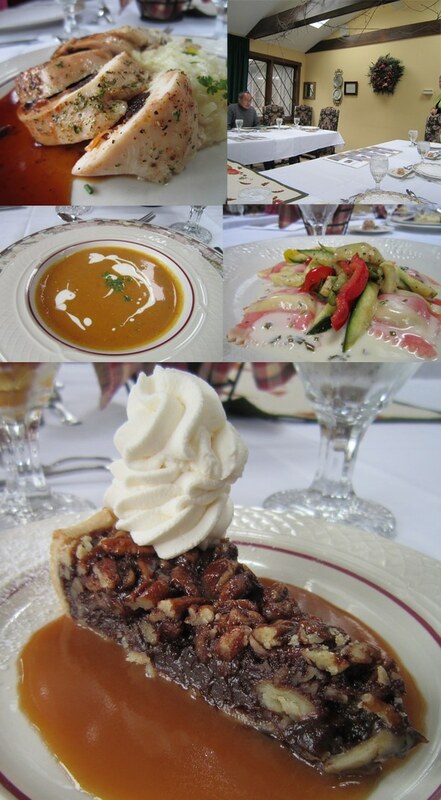 We also had the opportunity to visit Glenlaurel for a fantastic lunch. YUM! I’m talking licking the plate and begging for more meals. The owner joined us and recited poetry which practically made me cry. Everyone I met was so… genuine. There was no hidden agenda. Everyone did what they did because they loved to do it. A real treat. We also had the opportunity to visit the Columbus Washboard Company and learned about the history of the business, how the green living tide keeps the business thriving and how to make music with a washboard and a spoon. We got right down to it and there wasn’t a face in the room that wasn’t smiling. This was a particularly special meeting because I learned the owner of the factory sends over free kits to our troops overseas. For decades she’s been providing this service to the men and woman that serve this country and I thought that was just amazing. If you want more information on how you can get involved, be sure to visit her website. Before we left the factory the group was brought around back to meet their blacksmith. 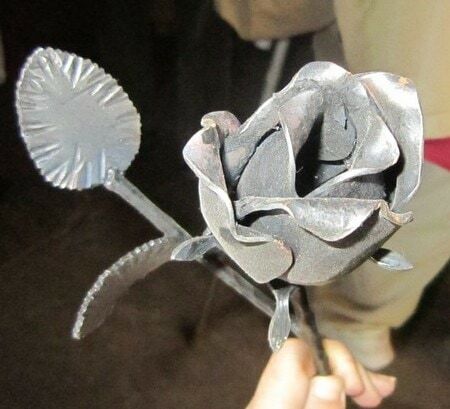 Just LOOK at this rose that he made. That is true talent. We drove down to Logan and went to the Apple House and heard about how apples were picked, stored and processed. And then… I met… the new love of my life – the apple cider slushy. You do NOT understand how fan-tabulous that puppy tasted. OH MY! Despite the weather I drank every last drop of that frozen goodie. Wish they could figure out a way to ship that around the country! One of our last stops on the tour was Frontier Trail Hike at Ash Cave. This was special because as you walked through the trail you were met by actors who spoke about different parts of our history. They even had a little fun with us. Another thing I found to be memorable was the amount of people who were involved with their community. Most of these actors (if not ALL of these actors) were volunteers who were doing their part to keep their town great. There’s something to be said for that. In closing I just want to reiterate that Ohio is a great and affordable place to travel with your family… ESPECIALLY if you are a nature lover. I am so happy that I had the opportunity to visit Hocking Hills and meet so many great people. My new friends I am sure will be with me for many years to come. We are already exchanging addresses for our Christmas cards! 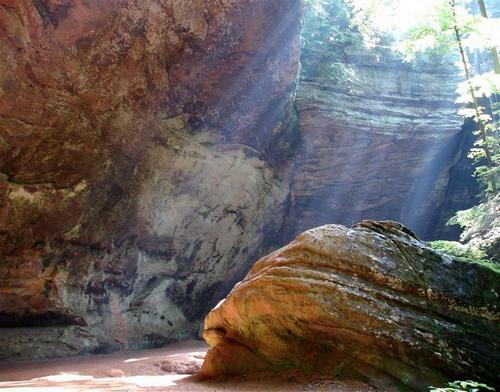 For more information, visit the Hocking Hills Tourism Website. First, I think it’s therapeutic to be “cut off” from technology every once in a while and just tune in to the “right now”. That place looks gorgeous. I have to say that I live just minutes from an amazing apple orchard but have NEVER heard of the apple slushie! yum! And what’s with the pie up above? DO TELL! LOL! It sounds like you guys had an amazing getaway and did a lot of really wonderful things! I would definitely consider a vacation there – right up my alley! I wold go just based on the pictures of the food! yum! I know, right? That’s all I’ve been drooling over. Ya’ll can go hiking, I’m going to hang in the restaurants. hahaha. I just gained about 15 pounds just LOOKING at that food. Amazing. Next time I’m in that side of Ohio, I’ll be stopping by. Looks amazing. And that first photo, holy GORGEOUS light! I had no clue Ohio had any place like that. Seriously, this sounds like the perfect place to head to when I need to reflect, relax and rest. The photos are incredible. Looks great! Very peaceful, old school “real” Americana. This is a dying lifestyle and one that should be preserved. I’d love to give this place a go. Looks great. Vera, what a relaxing retreat! Who knew, in Ohio? The cave looks really cool, and all that food looks amazing! It sounds like this is my kind of place!!!!!!!!!!!!!!!!!!!! We should ALL go to get away and relax…..no kids, no work, just pure relaxation! In Ohio, who woulda known? I definitely want to make plans for my next summer vacation over there. I ‘m a nature lover and I know the tranquil effect nature has on us. It’s priceless. What beautiful pictures, Hope you relaxed and remembered how wonderful our country truly is one of those hidden treasures. Glad you shared with us. We went here 2008 for our summer vacation with our 3 boys and loved it. Such a special place. We wish it wasn’t so far and could drive there for a quick weekend. Highly recommend it for families who like to walk thru nature and go do the zip line. Thanks for a great article. This was such a fabulous experience, all of the writers were awesome! I can’t wait to take my husband back for our anniversary. It was so nice to meet you Vera and this is a perfect re-cap of our trip! after reading this I definitely want to check it ALL out. so glad you had such a nice, relaxing retreat! I have to voice my gratitude for your kindness in support of women who require guidance on this particular theme. Your special dedication to passing the solution all-around had become amazingly valuable and have really allowed ladies just like me to attain their goals. The interesting guidelines can mean a lot to me and still more to my office colleagues. Many thanks; from everyone of us.